Now You Can Learn Wing Chun from the Top Sifus! ... Wouldn't it be great to hand pick the masters and lineages you want to learn from and then train full-time as their live-in student? 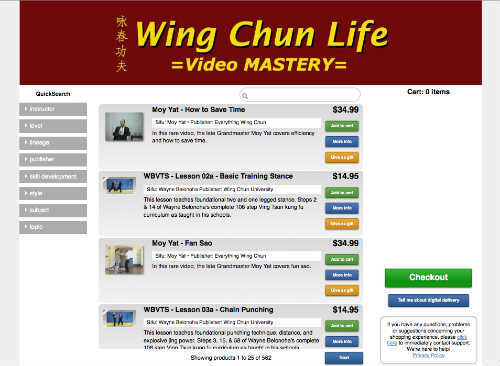 "WingChunLife's Video MASTERY" Gets You Close to Awesome (the rest is up to you)! 'Video MASTERY' is as close to working face-to-face with the world's best sifus as you can get... without getting your nose bloody. Plus, you save travel costs and time away from work and family. You will enjoy learning Wing Chun from dozens of the world's leading sifus through the power of video and audio. Watch, listen, and learn. What's more, you're always in control. Train or learn at home, on your computer, through a mobile device, and even listen to the lessons while driving (listen in the car, don't watch, please)! That's the power you'll enjoy everyday with 'Video MASTERY'. Weak Excuse- Solved! "Don't live near a Wing Chun kwoon." I hear from dozens of martial artists who have a tough time finding a school nearby and use that as an excuse not to train. Video MASTERY is your answer. The library contains over 543 video lessons from dozens of the world's top sifus. Moy Yat, Sifu Sergio, Wayne Belonoha, Wong Shung Lung, Robert Chu, Ip Chun (Ip Man's son), and dozens more with great new videos added all the time! The 'WingChunLife.com Video MASTERY' library is probably the largest online collection of Wing Chun kung fu videos anywhere. And you can download each one into the palm of your hand. Poor Excuse- Solved! "Don't have enough time to take live classes." Maybe the classes at your local Wing Chun club don't fit your work, school, or family schedule. Well, that's no longer an acceptable excuse! You now have command over your training schedule. Video MASTERY is the perfect solution when you're short on time for scheduled classes. Take control of your 'windows-of-time' (like midnight on a Saturday, or during national holidays) to watch and learn from a Wing Chun grandmaster, and practice the techniques and strategies on your own time. Lame Excuse- Solved! "Don't have enough money to pay for in-person lessons." Live Wing Chun lessons are not cheap and can add up. But if you have the desire to learn, you can create a budget and save up for a few video lessons and start from there. You're always in control with 'Video MASTERY'. For instance, you can learn beginning Wing Chun from sifu Austin Goh for only $11. Or the complete 108 step Ving Tsun system by Sifu Wayne Belonoha for just $14 per lesson. Start small and grow awesome! Buying video bundles can save you money and cost much less than an equal amount of live classes. For instance, Wayne Belonoha's complete 108 step Ving Tsun system bundled together is just $711. That's a bargain compared to what it would cost you to learn the system at one of his schools. Perhaps, you want to up your street fighting game. Sifu Alan Orr's complete NHB Wing Chun Collection is just $209 (bought together as a package), and shows you how to use Wing Chun in combat and on the street. Learn new skills or polish old ones. How awesome would it be to learn things even your sifu doesn't know. You will learn directly from the masters who excel in these areas and give yourself an edge. What's more, quickly improve your kung fu by purchasing specific videos in areas you're weak at, or those you want to improve faster! Consider, the biu ji form, butterfly swords, joint locks/chokes, the wooden dummy... Find exactly what you want and reach the next level with 'Video MASTERY'! All the videos are downloaded DVDs that play from your computer or device. They're NOT streamed or played over the Internet. This is great because it means after you download them, take your lessons and watch them anywhere. You're not slowed down by an Internet connection. Otherwise visit the 'Video MASTERY' library now. 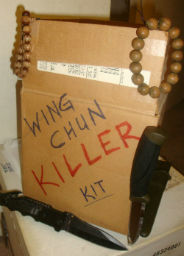 Grab your Wing Chun Killer Kit and get the special links to download sifu Wayne Belonoha's (author of The Wing Chun Compendium volumes I & II) Wing Chun/Ving Tsun foundations video, and sifu Fernandez's WingTchunDo basics -- FREE.